Truly the best chicken fried steak I've ever eaten. 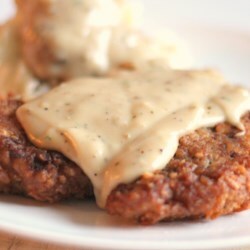 Chicken fried steak has always been a diner favorite of mine, but never cooked it at home. Followed the recipe exactly and was rewarded with a crispy, non-greasy, delicious coating on our cube steaks. I served it with collard greens and "irish champ" , an allrecipes recipe. Both my boyfriend and I loved it and will certainly serve it again. Thanks smylpurty!